Meerkats primarily eat invertebrates like insects and scorpions, spiders and also small vertebrates like lizards and skinks and occasionally small snakes. The main reason for this being their primary diet is because they do not have carnasial teeth (teeth designed for cutting meat). On the rare occasion meerkats may eat small rodents and even a small bird, but they encounter difficulties in eating this form of prey, and so often avoid it in their diet. Sadly meerkat tracks may be found around dead animals- since meerkats are curious and investigate everything they encounter in their territory. But they are not the cause of the animal dying. Meerkats are even blamed for eating ostrich eggs! They cannot possibly break the eggs - and only if the egg is already broken by a larger mongoose or jackal, will the meerkat sometimes drink the yolk from the broken egg. They are not the cause for the losses of chicks or eggs however. 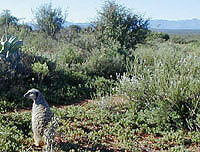 Many other mongooses' tracks are also often confused with the meerkats tracks. Meerkats are often wrongly accused of eating ostrich chicks or other farm animals- when actually they are innocent. Many other larger mongooses tend to eat larger prey items like these birds, and have cutting teeth, but these mongooses also control rodent plagues that destroy vegetation and crops and are really beneficial to have on properties. 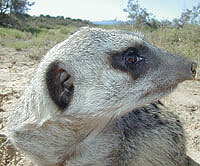 The name meerkat is often given as a label for many small mongooses and other mongoose-like animals. This confusion and lack of correct information is often why meerkats are misunderstood, or are blamed for stock losses caused by other creatures who specialise in larger prey items. Accusing an animal for causing stock losses without proof is like accusing all humans of murder because some humans murder! To judge all animals as guilty without proof, and then kill them, is the same as accusing all humans of murder and killing them, without any evidence! Nature conservationists are the animals and natures only spokespeople, unless there is a better understanding and respect of nature and how we are all so dependant on nature and its resources we will end up destroying it by mistake. Meerkatmagic wants to share the beauty of nature with everybody because once a better understanding of nature is gained, it will be preserved for all future generations to enjoy! All animals do play an integral role in nature. To persecute and kill an animal without even knowing if it is the cause of a stock loss is unfair and has far reaching consequences that affect the environment and ultimately the landowner. Please also remember that meerkats raised in captivity, do not have a natural diet and can learn to eat anything introduced to them by humans - wild meerkats have a natural diet. 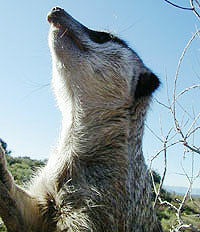 Tame meerkats are not comparable to wild meerkats in behavior and diet. Meerkats move around from one foraging site to another preventing overuse of natural resources in an area of land. This continual movement by the meerkats in nature is the equivalent of camp systems or rotational farming used by farmers. It is sustainable resource utilisation. Meerkats control insect plague breakouts by eating large quantities of insects each day, ultimately protecting the land from excessive damage caused by locusts and other insects like termites and ants. Meerkats break up hard compacted soil by their constant digging using their sharp claws. This digging helps to prevent soil erosion, by allowing rainfall to infiltrate the soil easily. This prevents what is known as the run-off effect, where water cannot sink into the soil and washes most of the topsoil away, which is so critical for plant growth. This wash away effect quickly leads to a more severe form of erosion like rill and donga erosion. But due to the meerkats digging habits, this soil erosion process is greatly reduced! Meerkat burrows channel large volumes of water deeply into the ground, and are like natures storm gutters. This again helps prevent erosion by sudden heavy rains, by absorbing the water into the ground quickly. This rapid water absorption into the soil protects nature and promotes the growth of new plants by trapping seeds in the dug out areas and burrows. This process of seeds accumulating in holes dug by meerkats, and then trapping water in the dug out areas, greatly improves the chances of seed germination. Humans use a similar farming technique to trap water and seedlings called crater plowing, which breaks up hard soil and allows water to gather around a seedling and give it a better chance to grow. Bare soil which has previously been eroded can recover more quickly when meerkats occur in the area, these diggings from the meerkats will promote pioneer plants to rapidly grow and stabilise the soil from further erosion. Meerkats digging around plant roots helps to aerate the roots and create new microhabitats for creatures and promotes plant growth by loosening the soil around the roots. 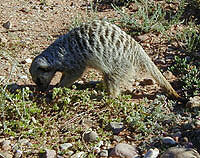 Meerkats also eat many of the creatures that eat plant roots! The removal of these root eating creatures results in the plants growing even better. Meerkats can prevent the need to use artificial pesticides to protect crops, these pesticides often damage the environment and are not selective in what they kill. Meerkats eat many of the pests on crops like lucern often used for ostrich food, without damaging the plants since meerkats do not eat plants! In synopsis meerkats on your property are a true gift - they are the guardians of your precious land and keep it healthy and pest free!